Unlike other competing systems, MedsCK's main review screen is intuitive, very easy to use and does not require you to scroll through pages of screens looking for information. Fast simple MedsCheck review and document generation is what sets MedsCK apart from other systems. Completing a review in MedsCK is more efficient than other commercial software applications. See the video demonstration to fully appreciate the ease in which you can conduct reviews using MedsCK. Being a web application, MedsCK reviews can be conducted on a laptop or other mobile device. MedsCK is portable. You don't need a dedicated computer permanently setup in the consulting room. Integrated version: dispensing history is automatically extracted to the MedsCK profile. Short-hand administration instructions are converted to consumer-friendly text. 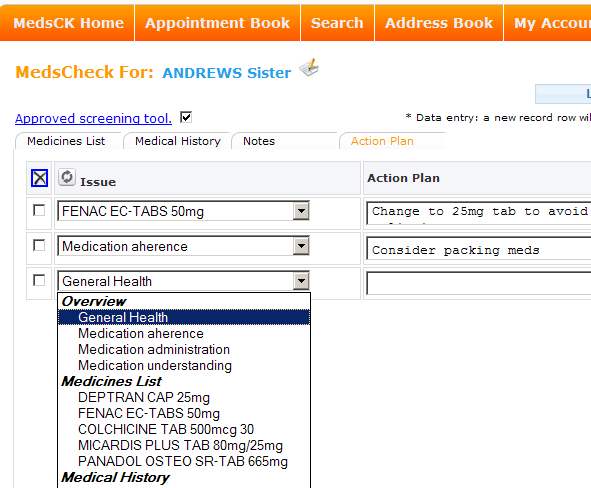 In the standard version, medications are manually entered from quick-search drug lists. 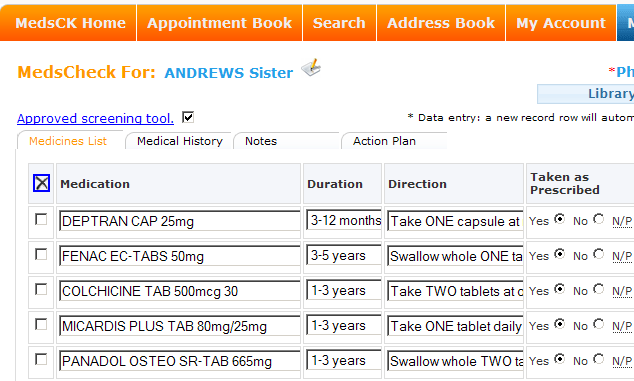 Optional patient medical conditions and symptoms can be entered into the consumer's profile (via quick-search lists). When compiling the Action Plan the pharmacist can access the patient's profile from the action plan template, without having to scroll or swap screens to reconcile the medication list. Consumer information leaflets can be printed from the library as required. No need to keep pre-printed information leaflets in the consulting room. Print as you need them. The MedsCheck required consumer documentation, Action Plan and Medication list, are automatically generated by MedsCK when the review is completed. Conforms to the PSA guidelines for review documentation. The medication list appears at the end of the action plan. Pre-filled claim form generated by MedsCK for consumer to sign. Copy of the Action Plan can be automatically faxed/emailed to the consumer's GP. MedsCK emails reminders of due Action Plan tasks assigned to pharmacists and includes a task list management screen for managing tasks arising from reviews.